Also serving communities of Monroe, Cranbury. There are 18 Memory Care Facilities in the Monroe Township area, with 2 in Monroe Township and 16 nearby. The average cost of memory care in Monroe Township is $4,820 per month. This is higher than the national median of $4,650. Cheaper nearby regions include Jackson with an average starting cost of $4,801. To help you with your search, browse the 26 reviews below for memory care facilities in Monroe Township. On average, consumers rate memory care in Monroe Township 5.0 out of 5 stars. Caring.com has helped thousands of families find high-quality senior care. To speak with one of our Family Advisors about memory care options and costs in Monroe Township, call (855) 863-8283. In Monroe Township, New Jersey, more than 36 percent of the population is aged 65 or over, which is well above the national average of 15.6 percent. There are three memory care facilities available in Monroe Township and another 30 in the surrounding areas for those who are dealing with Alzheimer's disease or other forms of dementia. These memory care facilities, which are officially known as Assisted Living Residences (ALRs), are licensed and regulated by the Department of Health and Senior Services. In the event of a medical emergency or illness, Monroe Township has several medical facilities that provide services related to brain health and dementia such as Robert Wood Johnson Medical Group. Families may have a good reason to be concerned about the cost of living in Monroe Township since it is nearly 50 percent higher than the national average. Housing prices, which are double the national average, are the largest contributor to these high costs. New Jersey's tax policies are somewhat friendly for seniors. Social security income is completely exempt from income tax, but retirement accounts and pensions are partially taxed. Income below $65,000 is taxed at a low rate which may make care in the state more affordable for families with limited budgets. The American Lung Association has determined that, due to an excessive level of high ozone days, Middlesex County gets an F for ozone pollution. Seniors are particularly vulnerable to this problem as ozone can cause problems with the respiratory and cardiovascular system. Monroe Township is considered a safe place for seniors with Alzheimer's or other forms of dementia to live. Violent crime is seven points below the national average, and property crime is 19 points below the national average. It is also relatively safer than the NYC metro area as a whole. Memory Care costs in Monroe Township start around $4,820 per month on average, while the nationwide average cost of memory care is $4,800 per month. It’s important to note that memory care rates in Monroe Township and the surrounding suburbs can vary widely based on factors such as location, the level of care needed, apartment size and the types of amenities offered at each community. Learn more about these programs, plus who’s eligible, on our Memory Care in New Jersey page. For more information about different ways to finance memory care, visit our Memory Care in New Jersey page. 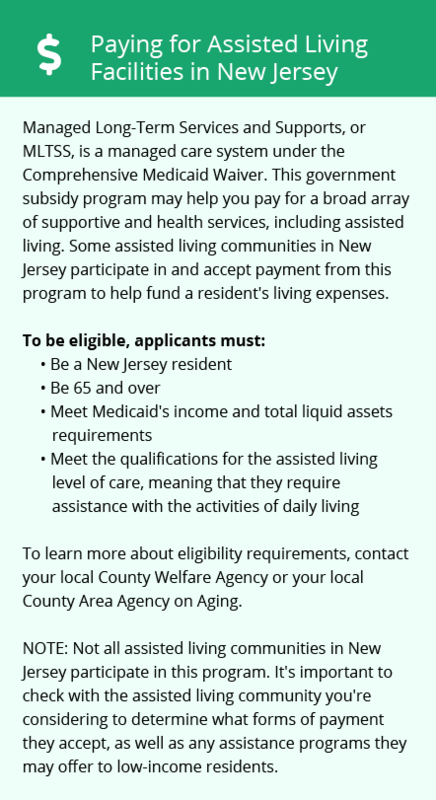 Monroe Township and the surrounding area are home to numerous government agencies and non-profit organizations offering help for seniors searching for or currently residing in an assisted living community. These organizations can also provide assistance in a number of other eldercare services such as geriatric care management, elder law advice, estate planning, finding home care and health and wellness programs. To see a list of free memory care resources in Monroe Township, please visit our Assisted Living in New Jersey page. 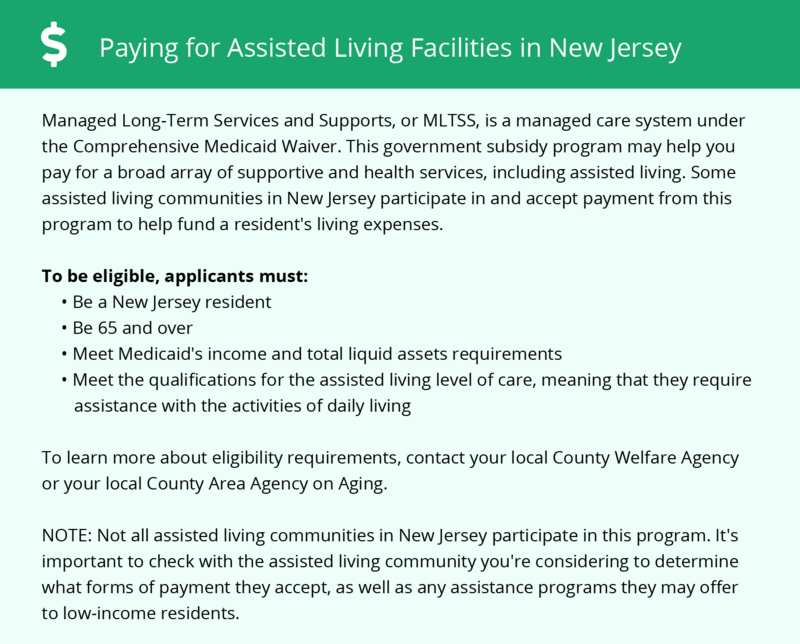 Monroe Township-area assisted living communities must adhere to the comprehensive set of state laws and regulations that all assisted living communities in New Jersey are required to follow. Visit our Memory Care in New Jersey page for more information about these laws.